Fall is in full swing as we move into October. Whether it be pumpkin spice, apple picking, or a hay ride, you’ve probably got at least one fall favorite you can’t wait to rush out and check off of your to-do list. With all of the activities that fall has to offer, it’s easy to lose track of time. Halloween is fast approaching and will be here before you know it. If you are looking for costume tips and ideas, or need a last minute how to, this is the read for you! Kids costumes, especially at Halloween stores, can be costly. There’s nothing more frustrating than looking through hundreds of options and deciding on one only to discover they’re out of the size you need. This year, we’ve got some easy DIY costumes that are sure to make you the coolest parent on the block. Parents are busy people, don’t let costume shopping slow you down! Some costumes are trick-or-treat classics, others a bit more unique. Either way you are sure to have one of the best dressed kiddos on the block! Hoo out there could be better dressed? The first outfit we have to show off is an owl. How many licks does it take to get to the center of a Tootsie Pop? There’s only one way to find out with this feathery halloween costume. This ensemble is perfect for any age or gender, allowing you to customize the look to your child. Choose between a rainbow owl, glitter owl, camouflage owl; the possibilities are endless. The simple template is also perfect for getting your child involved, let them pick out the colors, help you trace, and (depending on age) cut out the feathers for an even more hands on experience! Give a hoot about this costume? Find further instructions here. Image and content courtesy of Mom Always Finds Out. Continuing with an animal theme, we move onto our second costume. This costume inspires some serious social media action. All of your followers will flock to see this look! 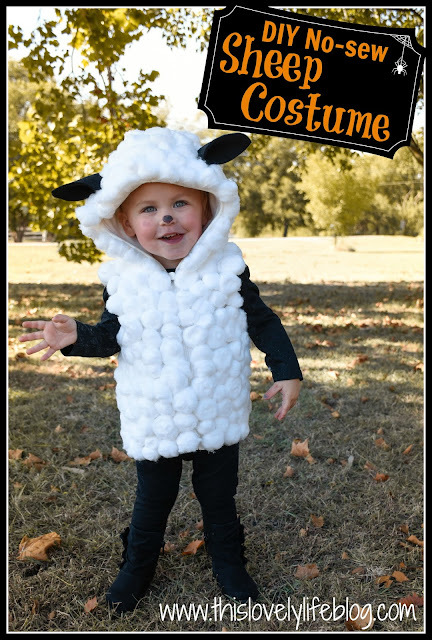 Made for comfort and warmth, you’ll love watching your little lamb this Halloween as they run off in search of treats. It’s also completely reusable come spring when Easter rolls around. Got it baaaad for this cute costume? Learn more about how it’s done here. Image and content courtesy of This Lovely Life. Herbivore, carnivore, or omnivore, this costume is perfect for the active kid that never stops moving. Be the best dressed species on the block this Halloween. This dinosaur costume is easy to construct and will leave your child warm and cozy as they go on the hunt house-to-house this season. Create tons of crazy colored creatures from the Jurassic Period in just a few simple steps. Roaring with excitement? Find out more on how to dress to impress here. Image and content courtesy of Ginger Snap Crafts. This next costume is a 2-for-1 and perfect for siblings or the best of friends! A spider web is a Halloween classic that these costumes pull off in perfect harmony. Stay stylish this halloween as a silly spider or a wondrous web. Tangled up about these tricky trousers? Follow the link here, to find out more on how to make them! Image and content courtesy of Pretty Plain Janes. Another simple Halloween staple is this boo-tiful ghost costume. 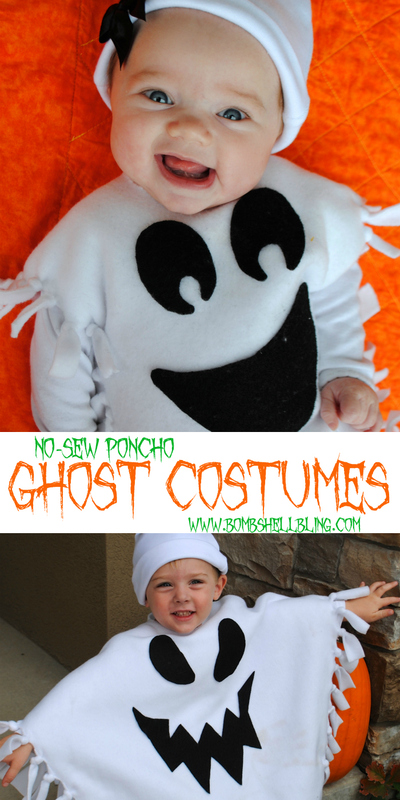 Age inclusive, this project offers two easy styles of poncho to fit your child’s ghostly needs. Another great feature about this project is the face is entirely up to you! Whether scary, mischievous, or friendly, this creative costume gives you plenty of leeway to let your personality shine. Perhaps consider attaching the face with velcro, allowing the poncho to become a fun customizable dress up toy, or even a snowman come winter time! Haunted by the possibilities with this ghastly get-up? Learn more here! Image and content courtesy of Bombshell Bling. Building the perfect Trick-or-Treat experience has never been so easy! 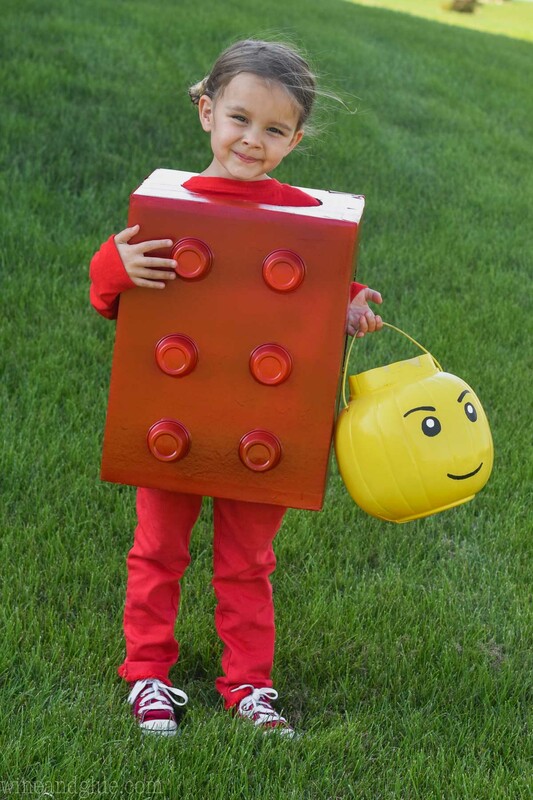 For the creative kid that loves to build and use their imagination, this is an ideal costume! Customize the color and bucket to the personality of the architect-in-training who will sport this colorful outfit. Another great team building activity, your child can help you assemble this just as they do with all of those tiny little building blocks. Laying the blueprints for a perfect Halloween? Get some tips and tricks here before you beak ground! Image and content courtesy of Wine and Glue. Happy haunting little ghouls and monsters! Comment below with your rendition of these DIY creations, or get creative and make something completely different! Together let’s make Toledo’s Halloween 2018 a spook-tacular affair. Lover of pugs, peppermint mochas, and graphic design, Maria is a content specialist for Danberry Realtors. The Home Sweet Toledo blog focuses on community guides + local events, as well as home inspiration + design trends. Enjoy!